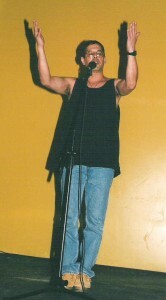 Tommy Mendez performs, circa 2000. 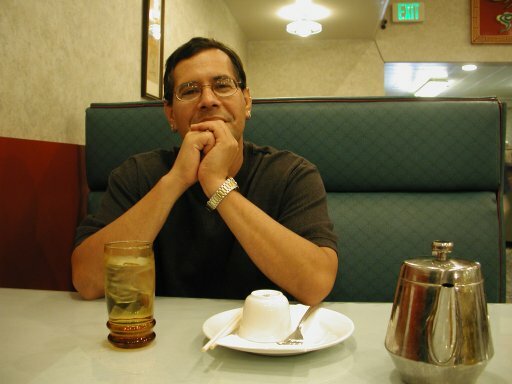 Tommy Mendez found the Cantab slam scene sometime in the late 90’s at the urging of then-regulars Brian Comiskey and Samantha Libby, and it became home not long after that. One of the many things he loves about slam/spoken word/poetry can be found on that stage every Wednesday night– people pouring out their hearts, open and honest and free with a true driving desire to get better each and every time. Tommy says he did so much growing during his time down those stairs and was absolutely thrilled to watch those around him grow as well. Veteran workshop student, co-host, assistant to the SlamMaster, Champion of Champions, and player/captain of the 2001 Boston slam team are just words fueling the memories of his time spent there. Captain Tommy Mendez kicking back between bouts at the 2001 National Poetry Slam in Seattle, Washington. whole world be warm as this. grow and bloom in you. Tommy currently resides in Austin, Texas, continuing to pursue his dreams as a chef. You can find him on Facebook.